The AUTOMATIC X is the world’s most technically advanced and uniquely easy-to-use vacuum cleaner! The 12-inch X4 features truly automatic height adjustment, using an electronic controller that measures the resistance of the spinning brush roller against the floor, and then it signals up or down adjustments, which ensures optimal performance on both carpets and hard floors. The user is also alerted to clogs, a worn brush, or a full bag, and the vacuum automatically shuts off when brush obstructions occur, to protect the motor and belts from damage. The X also has an instant-use cleaning wand and suction hose, a lifetime belt warranty, tool-free brush roller removal, a 40-foot power cord, and three on-board attachments. The integrated instant-use wand and suction hose are always ready. Just pull out either tool, or both together, to clean hard-to-reach corners, edges and crevices. The wand and hose together have an eight-foot reach. The suction hose is ideal for cleaning furniture. And an optional nine-foot extension hose is available, which creates a total hose length of 15 feet perfect for cleaning stairs. Choose from a range of optional attachments that can be fitted to the wand or hose! When the brush roller’s bristles are worn to a point that brush agitation is less effective, the red "check brush" warning light remains illuminated during use. (The vacuum continues to operate; it will not automatically shut off.) When needed, installing a new brush roller or cleaning hair or other debris from a used brush is quick and easy, and no tools are required! When the vacuum is stationary in its upright handle-locked position, the power head adjusts upward to the height necessary (or to its highest possible level) to disengage the spinning brush roller from the floor. However, if the brush remains in contact with carpet fibers, despite the power head’s upward adjustment, the red "check brush" warning light flashes to alert the user to avoid potential carpet marking from excessive use time in a stationary position. Usually, very high-pile carpets cause this situation, or the vacuum is tilted toward the brush roller while using the cleaning wand and/or hose. The solution is to tilt the locked upright handle backward such that the brush is raised above the carpet pile. When a full bag, a clog in the airflow pathway, or an excessively dirty microfilter is detected, the red "bag full or clog" warning light illuminates, the vacuum automatically shuts off after 30 seconds, and then the warning light starts continuously flashing. This feat- ure prevents overheating and motor damage from a lack of adequate airflow. The AUTOMATIC X is easy to carry or quickly unwind the cord, using its unique handle with integrated rotating cord hook. 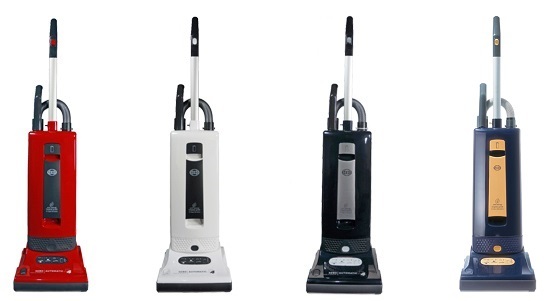 The AUTOMATIC X4 is 12-inches wide with a cleaning path of 10½ inches and one-sided edge cleaning. Water Lift (motor rating) 92 in.